3 CSS Tips to make your blogger template search engine friendly and receive Google search results and traffic from Google, Yahoo, Bing and other search engines. In previous article we discussed about 5 css tricks to get Google search results now in this article we will discuss 3 more CSS tips that can give you organic search results through tweaking your blogger template. We will discuss what you can do to your blogger template so that you can get traffic from Google search engine results. We will discuss here about those 3 top CSS tips for blogger that includes CSS sprites, external CSS sheet and how to make easy crawalable content using CSS. You can find more information in on page optimization tips and SEO tips that will give your Google search results. Use CSS sprites if you want to make your blog loading time faster and to create a fast loading web page. Through CSS sprites we just present multiple images on the place of single large images. This way we reduce the loading time of web page and it loads faster. We can use it through CSS background position. CSS sprites will increase your response time. And as we all know if a website has a low loading time and fast loading web page it will receive lots of Google search results. So always use CSS sprites. External CSS files are the best way to decrease your loading time and make web page loading speed faster. You can do it through hosting a CSS file on any other hosting website and then link back to it through your template. So that it will reduce your blogger blog's response time and web page will load faster. You can do it in your blogger template, cut all of your css code between <b:if> code and make a new file with CSS extension and then host it to any other website and then link it back by putting code in your blog header section. I already shared how we can make easy crawlable content in this article. CSS tricks for Google search results. But I recall it one more time. Use standard tags like H1 and H2 than the font tag. Avoid tables and use ol and li tags. 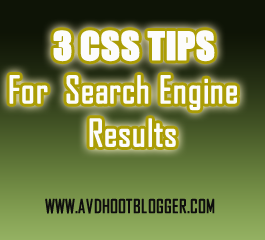 These are all css SEO tips that will reduce your blog response time and increase Crawlability and the result will be getting more search engine results. Description : 3 CSS Tips to make your blogger template search engine friendly and receive Google search results and traffic from Google, Yahoo, Bing and other search engines.